Detail : The Beatles fourteenth "official" album release, but the first after splitting, and this is where we stop counting these releases as official ! In 1973 E.M.I. (under the Apple banner) released two double albums of the "Best" of The Beatles, The Beatles 1962-1966 and The Beatles 1967-1970. The package of this release has the catalogue number PCSP 717, but the two albums are individually numbered as PCS 7171 and PCS 7172, which actually fits in with the Parlophone numbering of the time. The album was also released on cassette tape, Catalogue number - TC2 PCSP 717. The estimated worldwide sales of this double L.P. are under 2 million. 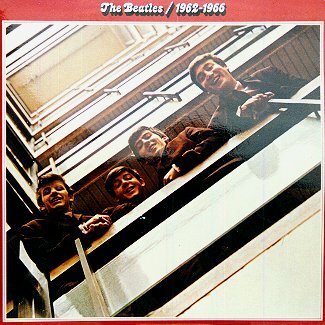 The gatefold sleeve features a shot on the front cover that was taken at the "Please Please Me" cover shoot, but is obviously different, and the rear cover is the shot that had originally been taken for the aborted "Get Back" L.P. The inner sleeves matched the colour of the front cover's outer border, and had the lyrics printed upon them. Unfortunately, nothing new on the album, every track had been previously released. And here we had a double L.P. with EVERY track written by Lennon & McCartney ! Five years later on 2nd December 1978 during the coloured vinyl boom, E.M.I. re-promoted the pair of L.P.s on coloured vinyl that matched the covers theme colour, e.g. the release of "1962-1966" was on red vinyl, and "1967-1970" on blue. Incidentally, my record catalogue also has an L.P. release of The red album in September 1991 on catalogue number PCSP 7231. The C.D. of "The Beatles 1962-1966"
+ Extended notes about the L.P. This set had a catalogue number of BEA CD 25/11, and was in a limited edition. 14th February 1994 - E.M.I. released coloured vinyl editions of the new digitally enhanced Red and Blue albums and pressed just 20,000 copies. E.M.I. then deleted the release immediately. I didn't notice any particular Beatles campaigns in 2007, but in October the "Red Album" hit the charts again. On 21st October it just about missed the Top 75 (the Official Chart) when it went from 193 to 77. But the following week on 28th October 2007 it entered the chart at no. 71. 4th November 2007 - The Red Album dropped one place to number 72. 11th November 2007 - The Red Album dropped from number 72 out of the official chart to number 79. 18th November 2007 - The Red Album dropped further out of the official chart to number 88. 25th November 2007 - For it's final week in listings that I could see, The Red Album dropped from number 88 to number 99. 18th October 2010 The Red and Blue albums were re-issued on c.d. under the guise of new "Re-masters". Of course, all they contain are the 2009 remasters re-packaged. an expanded picture booklet containing original liner notes, newly written essays by Bill Flanagan, and rare photos. Catalogue number: RED6266 (Barcode: 5099990675225). 24th October 2010 - The Red album re-entered the charts at number 6. 31st October 2010 - The Red album dropped 11 places to number 17. 7th November 2010 - The Red album dropped another 12 places to number 29. 14th November 2010 - The Red album dropped just 6 places to number 35. 21st November 2010 - The Red album went back up the chart to number 33. 28th November 2010 - The Red album went up again in the chart to number 28. 5th December 2010 - The Red album dropped back a couple of places to number 30. 12th December 2010 - The Red album dropped back another couple of places to number 32. 19th December 2010 - The Red album was a non-mover in the pre-Christmas chart at number 32. 26th December 2010 - The Red album dropped down 3 places to number 35. 2nd January 2011 - As Christmas sales dropped off the Red album dropped way back down the chart to number 74. 9th January 2011 - The Red album dropped out of the official chart, down to number 87. Note that there was also a set released of the Red and Blue albums coupled together. This special set entered the chart separately to the two individual sets for one week at number 59 on 28th November 2010. In following weeks it was listed outside the official chart at 97, then 97, then 85, then 95 (on 26th December) before disappearing. ©2001 Graham Calkin's Beatles Pages. All Rights Reserved.